Just as it happened with Bouzas in Vigo, the growth of Santiago de Compostela’s urban centre eventually came to absorb a town that had been, for almost a century, independent from the capital of Galicia: Conxo, a neighbourhood to the south of the city, proudly preserves traditions, buildings and stories that make it worthy of a visit all on its own. Under the shield with the Mercy’s yellow and red flag, ever present in the neighbourhood, Conxo was an independent town from 1835 to 1925, when it was annexed to Santiago de Compostela. It was a large municipality, even more so than the city itself, since it included rural parishes such as Aríns, O Eixo or Marrozos, to one side, and Villestro or Laraño to the other, and even a large part of the capital’s current Ensanche. The municipality revolved, as it still happens nowadays, around the church of Nosa Señora da Mercé, which emerged from a monastic congregation in the fifteenth century. 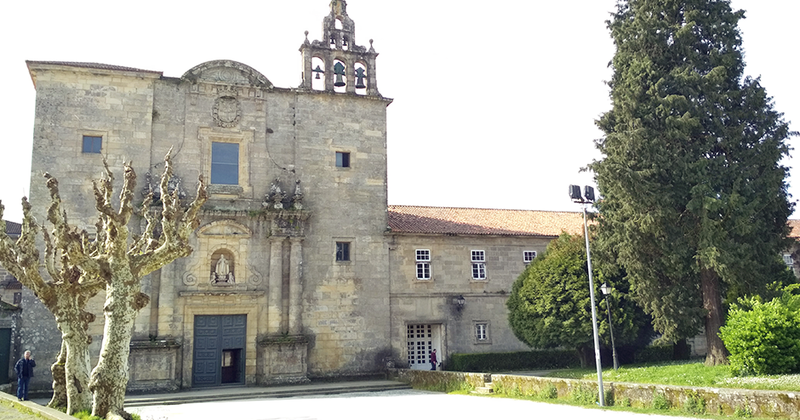 The Mercedarians held the convent until the end of the nineteenth century, when they left it for San Xoán de Poio, in Pontevedra. Left over from the original building are, inside, some interesting vestiges of the Romanesque cloister, in the church’s back area, which give way to another one of the elements for which the parish is well known: the psychiatric hospital. Because Conxo is also a neighbourhood heavily focused on health care. In addition to the psychiatric building (the central staircase, magnificently carved from white and Carrara marble, is incomparable), the neighbourhood is home to the Provincial Hospital, where many patients go every day to receive treatment. The history of Conxo is filled with outstanding events. The parish housed the A Rocha Forte castle, razed in the fifteenth century after a fierce siege. Today you can visit its remains, in process of restoration. The area also hosted a very important episode in the history of Galicia, known as the Conxo banquet. This meeting took place in 1856 and in it university students, workers, peasants and the well-educated bourgeois joined in fellowship. It was attended by intellectual figures of the time such as Eduardo Pondal, who even prepared and recited a few verses for the occasion, the local poet Aurelio Aguirre and, allegedly, Rosalía de Castro herself. The forest in which this meeting was held, closed up for decades, was recently opened to the public, creating an uninterrupted path along the river that connects Conxo with the Sar neighbourhood and crosses a large part of the city’s southeastern area. Conxo even has its own music. Between the nineties and the beginning of this century existed in Santiago a psychedelic rock group with strong poetic imprint, comprised of seasoned members of the Compostela pop, theatre and literature scenes. They were, aptly named, the Psicofónica de Conxo.